E-Prime 3.0 provides the user the ability to upgrade experiments that were originally designed in E-Prime 1.x and E-Prime 2.0 (Professional and Standard) to the new .es3 experiment file format. NOTE: Upgrading the experiment to the .es3 format cannot be undone. However, the original .es or .es2 file is still preserved. Clicking 'No' cancels the upgrade operation. 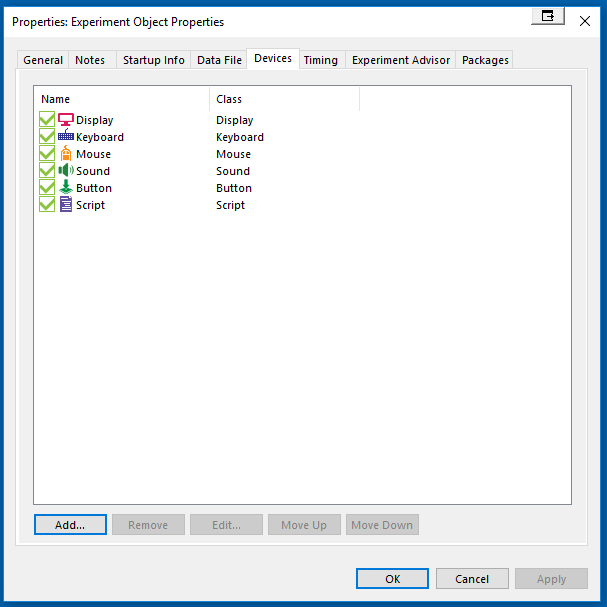 Upgraded experiment files maintain the original file's Toolbox Defaults. Although there are several new defaults in E-Prime 3.0, the ONLY changes that are enabled upon upgrading .es or .es2 files to the .es3 format is the addition of two new devices: the ButtonDevice and ScriptDevice. 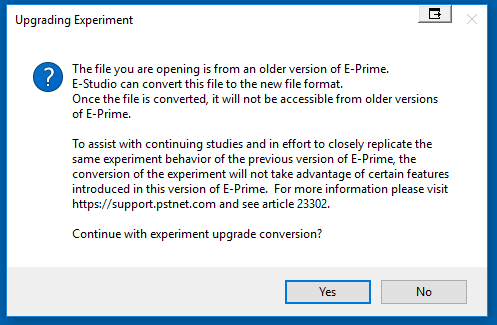 Experiments created in E-Prime 3.0 (.es3 files) cannot be opened in E-Prime 2.0. This is because E-Prime 3.0 has many new features not supported in E-Prime 2.0.